Rooted in Australian Food Culture, the “Salt” name has, in recent years, been growing in Singapore. 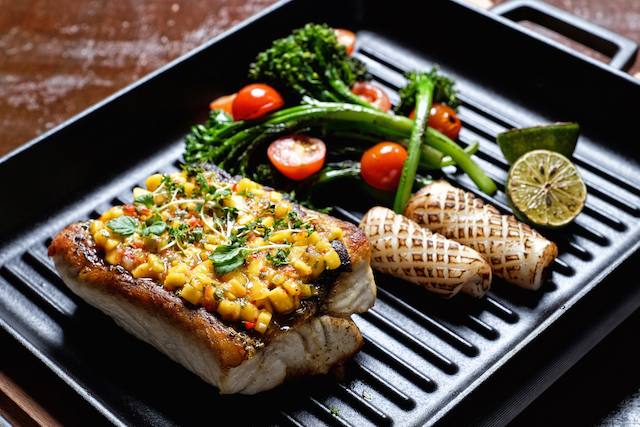 Its second restaurant after Salt Grill and Sky Bar sits right opposite the iconic Raffles Hotel, and is situated at the ultra-convenient Raffles City Shopping Mall. Well, yes they do serve dinner. In fact, this tasting was to showcase a new menu that would lean more towards the vibrant, group dining experience that they want to foster. I’m glad I went with an empty tummy because Executive Chef Ronald Li prepared a tasting menu full of dishes for us to try. We opened the night with a Taco of tempura prawn, pineapple salsa, chipotle mayo ($12++). 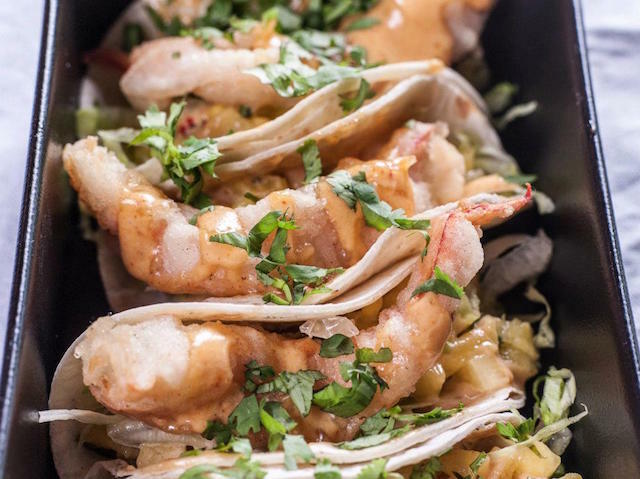 The lightly-battered prawn is placed in a soft taco, adorned with the salsa and chipotle mayo. While the prawn was indeed crunchy, I felt that the mayo overwhelmed the dish, so I didn’t taste much of the prawn. This appetizer, however, does a good job of just whetting your appetite for more. 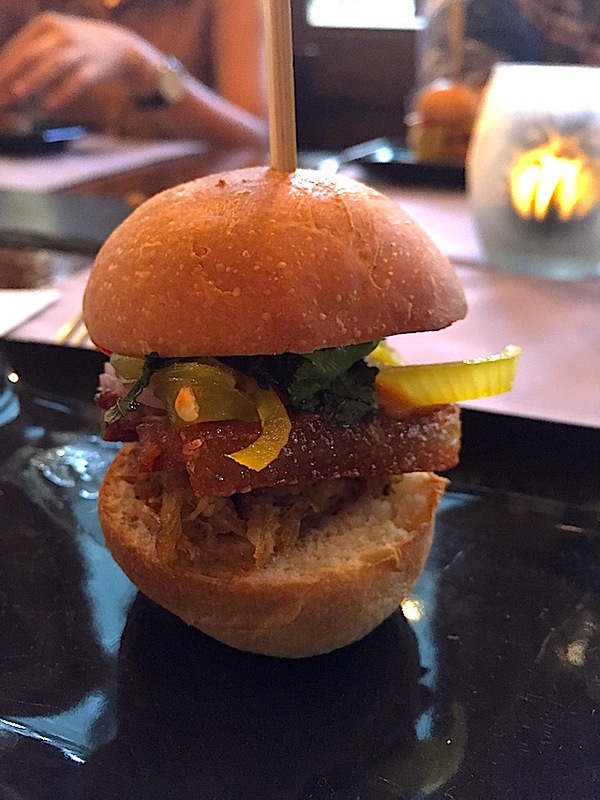 There was, however, the pork belly sliders, pickled cucumber and chilli ($13++). Now, this one, you must order if you’re with a group of friends. It’s a decadent little treat for everyone at the table. The belly is first sous vide at 95 degree celsius for 12 hours and then pan-seared to a crisp while the buns are actually made in-house. It’s easy to eat and I can imagine downing these with an ice-cold beer next to me. Marrow is staring to get really fashionable, with many other establishments coming up with their own take on the dish. 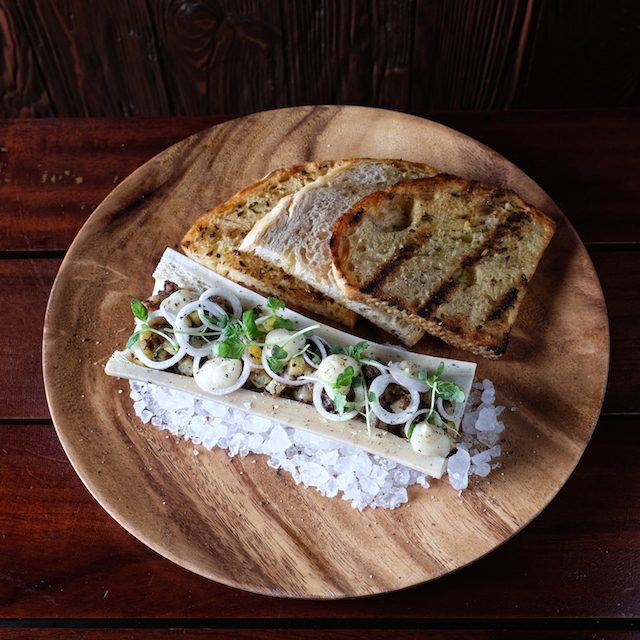 This Bone marrow with shiitake duxelle, holland potato and garlic toast ($20++) is actually Chef Ronald Li’s version of the original version done by Chef Luke Mangan. Chef Ronald added the holland potatoes to give the dish more body, and I think it’s a solid tweak to the original. It was really easy to chow down on this truly hearty dish and the dinner party wiped this plate clean! Before the mains were served, we had a little bit of Beets, ricotta, figs, pickled green chilli, honey and thyme dressing ($14++). I’ll have to say, this is one of those “love it or hate it” types. I love my veges, but I really had trouble coming to terms with the mix on this platter. The ricotta helped a little and I absolutely loved the beets, but I’ll give this a pass when I come again as I felt like the flavours of this dish didn’t come together as well. Some of the others at the table, however, loved this one to bits. 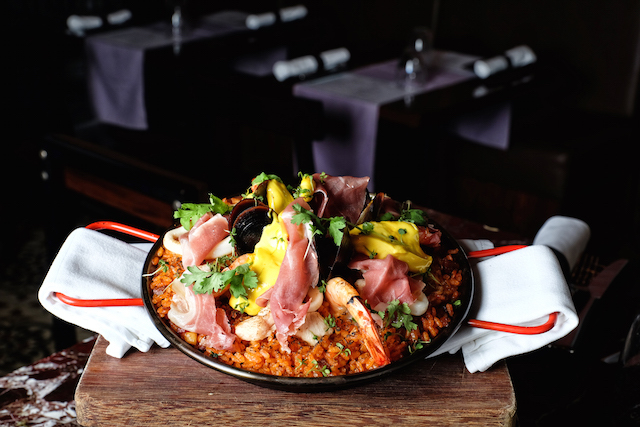 The first main I was exposed to was the Paella of prawns, mussels, squid, chorizo, chicken, prosciutto and saffron rouille ($39++). The flavours are balanced, seafood is fresh and the rice doesn’t char and stick to the pan. Talk about the rice, it’s not dry like most paellas. In fact, it is just a little like a risotto. It’s just slightly wet, and remarkably savoury. I am told that the rice is so flavourful because the onions, chorizo and bacon are sauteed before adding in paella rice to simmer in chicken stock. This generous portion is just right for 4 people. If the paella is the band, then this next main of Pork ribs with sauteed peas, edamame and mash ($55++) is definitely the lead singer. 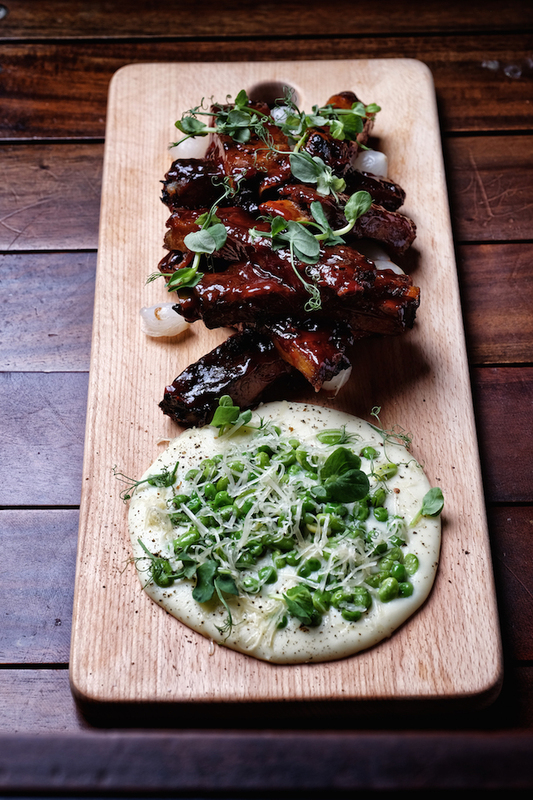 It’s not easy to do a pork rib that just falls off the bone when you dig your fork in, but Chef Ronald has done it. The ribs are slow-cooked till tender, then slathered with BBQ sauce for that classic taste all meat-lovers know so well. If your dinner party has space for only one dish, this is the one to order. The final main that I tasted was the Grilled Barramundi, Mango Salsa and Sauteed Brocollini ($60++). What I loved about this fish was how simply it was prepared: just grilled with a dash of yuzu! The barramundi was fresh enough for Chef Ronald to just grill over. However, I did think that the fish was a little bit dry, so there is room for improvement with the timing of the dish. 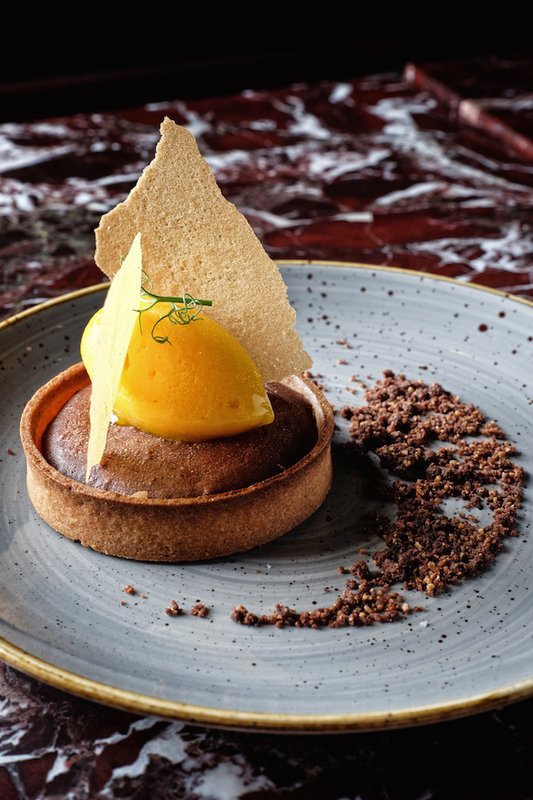 Finally, the dessert I want to talk about is the Gooey chocolate tart with mango sorbet ($14++). If you don’t have a sweet tooth, this chocolate tart will still win you over. The balance provided by the mango sorbet serves as a counterweight to the thick chocolate that oozes out of the tart when you break it up. This one’s proved to be an instant hit with the ladies. I think what I got from this tasting was a sense that Salt Tapas & Bar’s Chef Ronald Li set a high bar for himself, and they’re spot on with most of the dishes. 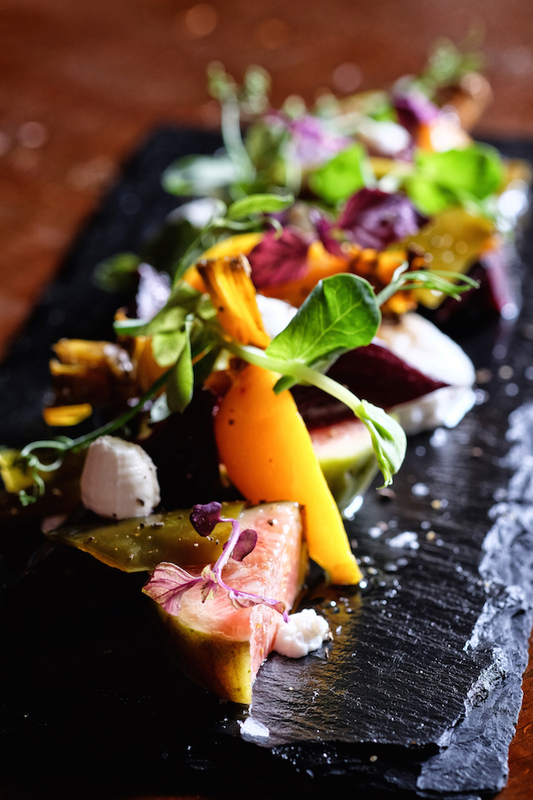 If you really want a decadent dinner with a bunch of friends, then Salt Tapas & Bar is the right place to take them. The portions are generous, the food is high quality and prepared with care. That’s all you really need to have a good time. I would like to thank Ada for hosting us. You were very gracious and I certainly felt at home.